At first glance, the bridal gown shop in the Palestinian city of Nablus appeared innocuous. But behind the scenes, Israeli intelligence says, the store served as a front for a major West Bank gun parts distribution center. "Components for weapons were continuously being sold out of there," a senior Israel Defense Forces (IDF) source told The Investigative Project on Terrorism. The store turned out to be part of a wide network of weapons dealers who had imported their lethal goods by ordering them on the internet, the IDF stated this week. Nine suspects, including the store owner, are in custody, and additional members of the weapons trafficking ring remain at large. "They came from all walks of life and from varied layers of Palestinian society," the source stated. Since mid-2016, the IDF has been engaged in an intensive, large-scale campaign to seize as many firearms circulating in the West Bank as possible to prevent them from falling into the hands of terrorists. A growing number of such firearms have been used in deadly attacks, such as the Sarona Market shooting in Tel Aviv last June in which two Palestinian gunmen murdered four people in a restaurant. The gunmen used locally produced automatic rifles, dubbed 'Carlos' due to their resemblance to the Carl Gustav Swedish sub-machine gun. While the latest wave of arrests focused on traders who used the internet to import gun parts, most of those on the IDF's target list manufacture and assemble guns in local workshops. Seven such workshops have been shut down since the start of 2017, and 84 guns have been seized by Israeli security forces, according to figures made available by the IDF. "The terrorist threat picture has changed. In the past, the main threat was posed by organized, institutional organizations," the senior security source said. "For the most part, these were hierarchical terror cells, with a clear division of labor. There was someone responsible for financing, someone else had the designated job of transporting the suicide bomber or gunman, etc. This threat still exists. Hamas is trying to organize such cells all of the time. But the main challenge these days comes from terrorists that we do not have prior knowledge about." Lone attackers, or small, localized cells with no organizational affiliation or background of security offenses, are far harder for intelligence services to detect, and these are just the type of terrorists who are likely to use firearms available in their surroundings. These types of attackers, some of whom have suicidal tendencies or personal crises, according to the source, often will attempt simple attacks, using whatever is at their disposal. This can take the form of knife or vehicle attacks, or picking up locally available weapons. Guns in the West Bank can be purchased by Palestinians for many reasons; whether for personal protection, to defend families and clans, to fire at wedding celebrations, or to reinforce one's sense of ego. As long as the guns are cheap and affordable, the source warned, "anyone can get [them]. Many of the shootings cells we captured in the West Bank were armed with these types of weapons." A year ago, a locally produced Carlo rifle cost around 2,300 shekels in the West Bank, meaning that Palestinians could purchase it with a single month's salary, or take the money from family members, before moving ahead with an attack. "The Sarona Market gunmen had no outside financial support, but still managed to get their hands on their firearms. The suits they wore [to disguise their identities] cost more than their guns," the source said. "This is why we are in the midst of an intensive campaign targeting the manufacturing and trade of weapons and gun parts. Even if I can't get rid of the illegal weapons phenomenon, I can make them less accessible, and much harder to traffic in them." The increased Israeli pressure makes it more difficult to obtain guns, and increases the odds of catching people before they can attack. They have to leave their village or neighborhood and move around with the firearms where they can be caught and intercepted by the IDF. "People will fear more getting caught and moving around with these firearms," the source said. The Palestinian Authority would also like to see these guns taken off the streets, the source said, since it encourages lawlessness and anarchy in some areas that pose challenges to its rule. Nablus, Balata Camp (next to Nablus), and Hebron are gun manufacturing focal points, according to IDF assessments. In addition, areas like Ramallah, Kalandia, and Palestinian neighborhoods on the outskirts of Jerusalem have workshops that take air or toy guns and convert them into real firearms using stolen components. 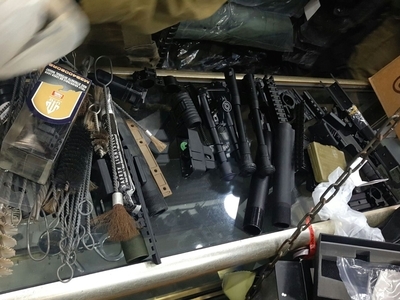 Thefts from IDF soldiers and Israeli civilians, as well as trade with Israeli weapons traffickers who do not care where the guns end up provide other sources of terrorist arms. Efforts by security forces to stem the tide were beginning to pay dividends, the source said. Today, a Carlo gun costs more than 6,000 shekels, as numbers dwindle. "With time, we are seeing improvements," he said. "We are seizing more than we did in the past, and our intelligence techniques have improved, so that we can capture guns not only in homes, but also in the manufacturing locations, and when they are moved around. This is a campaign. No single incident will stamp out the problem. So long as the profit from this trade is big enough compared to the fear of arrest or facing raids, many Palestinians will continue to be active in it. " Ultimately, he said, "over time, we will seek to decrease the number of guns and keep raising the price. This will result in less terrorists getting their hands on them, and resorting to less lethal attack forms, such as knife attacks. Our soldiers' alertness [to knife attacks] means such attacks produce less casualties - meaning that our effort will boost security."